Combined Type 1, 2 and 3 tested protector (to BS EN 61643) for use on mains power distribution systems primarily to protect connected electronic equipment from transient overvoltages on the mains supply, e.g. computer, communications or control equipment. 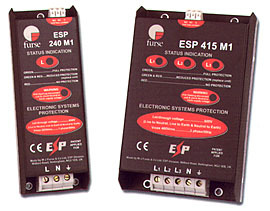 For use at boundaries up to LPZ 0B to protect against flashover (typically the main distribution board location, with multiple metallic services entering) through to LPZ 3 to protect sensitive electronic equipment. Install in parallel, within the power distribution board or directly (via fuses) on to the supply feeding equipment. At distribution boards, the protector can be installed either on the load side of the incoming isolator, or on the closest outgoing way to the incoming supply. Connect, with very short connecting leads, to phase(s), neutral and earth.